Home » News » Super-Hiker to visit the Scotchmans. Super-Hiker to visit the Scotchmans. National Outdoor Book Award winner visits Friends of Scotchman Peaks Wilderness. Liz Thomas has some interesting things on her resume. Outdoor writer for the New York Times. Former holder of the women’s self-assisted speed record on the 2,181-mile long Appalachian Trail. Vice president of American Long Distance Hiking Association-West (ALDHA-West). Her “trail name” is “Snorkel.” And, she’s author of Long Trails: Mastering the Art of the Thru-Hike. Long Trails is a winner of the National Outdoor Book Award in the “instructional” category. Thomas will be signing the book March 4 at the Hope Marketplace in Hope from 2 to 4 pm; March 5 at Vanderford’s in Sandpoint on from 1 to 3 pm, and Bonners Books in Bonners Ferry beginning at 6 pm; and March 6 at the Well-Read Moose in Coeur d’ Alene. Thomas’ book is a how-to for folks contemplating undertaking a long walk on one of the growing number of national scenic trails. Included in Long Trails is trail-proven advice on selecting gear, stocking resupplies, and planning a budget and schedule; as well as gorgeous photographs of life on the trail as a thru-hiker. Thomas definitely has the credentials to be an authority on the subject. She’s hiked twenty long trails and does extended urban hikes. A video on her web site — www.eathomas.com — features a 200-mile hike around the Seattle area. 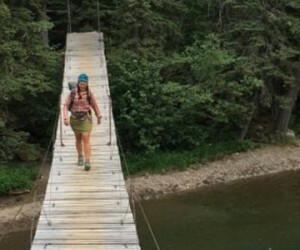 She is also is a “triple-crowner,” one of a small number of people who have completed the Appalachian, Pacific Crest and Continental Divide Trails; an accumulative mileage of over 7900 miles. On foot, carrying her world on her back. “Thru-hiking,” is hiking “thru” all sorts of terrain, weather, elevations and isolated places for long distances, generally, but not always, beginning at one end of a trail and proceeding to the other. The book provides peeks into not only the Triple Crown trails, but also lesser-known long trails throughout North America. While in North Idaho, in addition to book signings, Thomas will attend the ALDHA-West “ruck” in Hayden, Idaho on March 3 and is leading a hike for Friends of Scotchman Peaks Wilderness on March 4 on Star Peak (the hike is full).